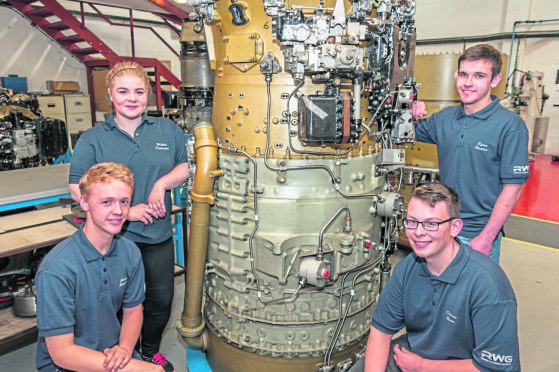 RWG (Repair & Overhauls), an Aberdeen firm specialising in the maintenance, repair and overhaul of industrial gas generators and power turbines, launches the latest edition of its long-running apprenticeship programme today. The joint venture between energy services giant Wood and German industrial machinery giant Siemens plans to recruit eight apprentices this year. Since 1990, the company has put 162 apprentices on the path to careers in gas turbine maintenance. More than half have qualified through its in-house training school. RWG’s apprenticeship scheme is accredited by the sector skills council for science, engineering and manufacturing technologies, the Scottish Qualification Authority and industry training bodies. RWG apprentice training officer Danny Dean came through the programme and is now on the path to an engineering degree.